Whether you need programmable thermostats, a digital thermostat or non-programmable thermostat; Pearce Heating and Air Conditioning will help you find the right control for the HVAC configuration in your home. 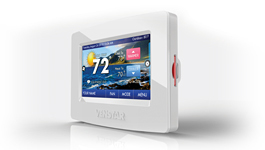 Many options exist in modern thermostats. Color touch screens that are easy to use and can display family photos, 7-day programming and even remote access are features that you will make your indoor comfort control better than ever!